The original Toyota Sienna was distinguished only by its Toyota workmanship, though, given Honda's failure in this area, that may have been enough if the price was right. This time around, though, Toyota seems to have examined the few shortcomings of competing vans and eliminated them one by one. Let's start with the innovations. The Sienna's top-line XLE Limited easily out-impresses any other minivan, not just with leather on the seats and doors, with with well-applied wood trim - including on the steering wheel, a luxury touch not common on an ordinary brand. The materials and designs seem to have been carefully chosen for an aura of luxury. 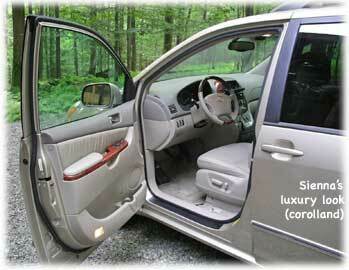 This is a minivan that a Lexus owner would not feel out of place in. A common parental add-on is a little mirror to view the passengers. The overhead console of the Sienna XLE contains not a place for sunglasses (there is an overhead sunglass bin over the driver's window), but a round mirror which can be moved to show the entire rear of the vehicle, or to focus on a particular seat. It's a great device for a kid-mover. Sometimes, one tends to sit in the car while the kids watch a movie - for example, waiting for a spouse to come back. In the Sienna, as long as the emergency brake is engaged, the DVD display will appear in the navigation system screen as well as the roof-mounted screen; indeed, the nav system provides a better view of the movie. The nav system has another unusual feature - a touch screen for faster entry of addresses and such. The Sienna is also the only minivan sold with functional windows on the sliding doors - that is, windows that come down 2/3 of the way for added ventilation. What's more, as with the Camry, the rear windows (for both rear rows, though not for the gate) include integrated sun-shields that hook in at the top of the window. These convenient sunshades are good for keeping the interior relatively cool while parked, but their main purpose is to avoid glare and sunburn for the kids. 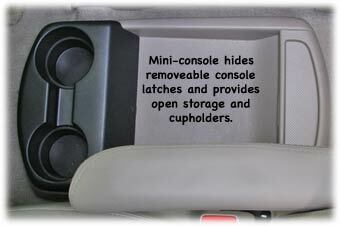 One potentially life-saving feature, available as an option with the DVD system, the rear-view camera. As vehicles have gotten larger, and even passenger cars have gotten impeded rear vision with higher trunks, the number of "driveway deaths" have increased, with children being the main victims. The Sienna's rear-view camera can be somewhat useful for parking, but its main reason for being is to show you any little people who might be behind you as you back up. It comes on automatically as you reverse, and uses a very wide-screen lens so you can spot running children who may be entering your path. This is a terrific option for parents - or people who live near parents. For easier parking, the Sienna has a sonar system which measures the distance at each of the car's corners, and sounds an alarm when you get too close. The alarm starts out strident but gets even more so with distance, going from blinking to a solid sound and light (in the climate control area) to show you which sensor was activated. This one can pay for itself with a single mis-judgement, though we do prefer the systems with LEDs in the actual part of the car that has the sensor. It's standard on the XLE Limited. One unusual feature whose usefulness can be debated is the laser-operated distance-based cruise control. It's activated the same way as a standard Toyota cruise, operating on a convenient dedicated stalk; but in addition to locking in a speed, it also keeps you a given distance from the car in front, downshifting if needed to avoid a collision. Its controls are very simple for the driver. It uses a display underneath the speedometer to show the distance selection, and whether the system has locked into a car ahead and is maintaining its distance as well as its speed. If you have it set for 65 mph and a car going at 55 mph moves in front of you, it will slow down - downshifting if needed to use engine braking - and then when the car moves away, it'll hit the gas and get back to 65, again, downshifting if necessary for acceleration. The one odd part is that, while most cruise controls move the speed up and down in 2 mph increments as you hit accelerate and decelerate, Toyota's moves to the nearest 5 mph - so if you lock in at 48 mph (it tells you the lock-in speed), the next push up goes to 50, then 55, then 60, etc. The system is quite good in practice relatively uncrowded areas, but can be disconcerting and inefficient in busier traffic, with constant speedups and slowdowns taking a hit on gas mileage (it is smart enough to know when a car that's cutting in is accelerating away from you, requiring no action). The only real oddity about the system is the way that, instead of having a light for CRUISE and another for SET - or just a single cruise light - it puts on a green CRUISE light and an amber READY light until a speed is locked in. 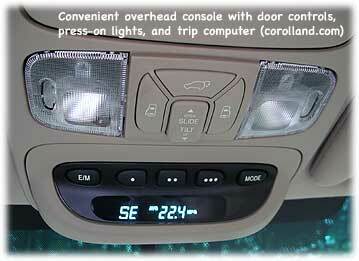 The final very clever addition to the standard minivan paradigm is the moveable center console. While competitors also have these - some with power adapters built in - Toyota also provides a "mini console" which covers up the mounting points, which can be collecting points for debris, and adds dual cupholders. This can be handy if you move the console to the middle row of seats, because it provides the front passengers with replacement cupholders (adding to the one built into the dashboard and the ones built into each door). Third-row passengers also have two cupholders along with separate consoles built into the mouldings on each side - but this feature dates to the 1984 Plymouth Voyager and Dodge Caravan. Overall, including the six (yes, six) cupholders built into the main console and the two in the mini-console, you can have a full seventeen cupholders. The main minivan selling points have usually been convenience and safety, rather than the engine - which makes sense, because if the engine was more important, nobody would ever have bought the original, 86 horsepower, 3,000 pound Voyager, and minivans would never have evolved past an ignored Plymouth niche. The Sienna has class-leading horsepower, coming from a relatively small 3.3 liter engine with dual overhead cams and variable valve timing coupled to an unusual five-speed automatic whose high top gear helps gas mileage. The result is outstanding EPA gas mileage coupled with best-in-class acceleration sprints. The downside of the small, technologically advanced engine and high gear ratio is a subtle feeling of something missing, compared with the 3.8-equipped Grand Caravan. While capable at any speed, the 3.3 doesn't feel as solid as the torquier 3.8, particularly on steeper hills - but the distinction is relatively minor, and both are more than adequate for the task. Acceleration is quite good by minivan, SUV, and car standards. With superior acceleration and comparable interior space, you'd expect gas mileage to be lower, but it isn't: despite a surfeit of features and quick sprints, the Sienna gets 19 city, 27 highway, putting it above the Grand Caravan 3.8's 18 city, 25 highway, and far above any similarly sized SUV. In actual driving, we found that the Sienna really did end up being about 1 mpg above the Grand Caravan. Both run on regular gas, though Toyota recommends premium (91) for "improved performance." The efficiency is amazing, given that SUVs with similar interior space can't come close, and even full-sized cars aren't any better - indeed, the Dodge Magnum has EPA ratings and acceleration roughly identical to the Sienna (with the mid-level V6); the Toyota Avalon manages to get another 2 mpg with similar acceleration but seating for only five. The transmission is controlled from a gated shifter located, of all places, on the center stack, apparently learning from the Prius experience. Most minis keep their shifters on the column, which is convenient though less sporty looking; the Sienna's works just as well, but gives you more gear-selection options, letting you limit transmission travel to any gear - and there are five. The default locations are very easy to get to, so you can ignore most of the settings most of the time. The feel is not different from a car with a conventional gearshift location. Cornering generally feels good, though not up to the high standard set by the Grand Caravan, with a moderately firm ride that nonetheless filters out major bumps and disruptions. Rough pavement is handled quietly and easily. The Sienna feels confident in thunderstorms. Braking is effective. Visibility is excellent, with only one real obstruction (the rearmost post, though to be fair, the rearmost window can also be blocked out by the second-row headrest). The XLE comes with the wiper warmers pioneered in the Caravan, and adds electric rearmost side window demisters. Wiper warmers are a terrific convenience in winter: they keep the wipers from getting frozen or slushed up. High-intensity discharge headlamps, not seen on minivans until now, are included on the XLE Limited, with a height adjustment feature that can and should be set according to the instructions in the owner's manual - but which has plenty of room for more conservative movement (that is, you can move them farther down to avoid blinding other drivers when you don't need to see as far forward). This is fairly standard in Europe, but in Europe, they also tend to give out tickets for badly adjusted headlights; in the US, many seem to think it's cool to blind oncoming traffic. We hope that was a factor in Toyota's calculations, and suspect it was, because the system only allows for a little upward travel. The instrument panel is clear, elegant, and nicely laid out, with a large tachometer on the left, an even larger odometer taking of the center, and the fuel and temperature gauges sharing a circle on the right for a balanced, symmetrical pattern. The gear indicator is between fuel and temperature, showing all the gears in the same pattern as the physical gear-shifter gate; the side the fuel door is on is also indicated. The large odometer is handy, at least partly because the magic 55 mph is right on top; this means, among other things, that the gauge is over to the right during normal highway driving, and that it's easy to monitor your speed on city streets. At night, a pretty and unconventional blue backlighting applies only to the needles and silvered part of the gauges for a clear and elegant effect. Toyota did their homework on this one. Controls are logical and easy to find, for the most part, from the interior light control (clearly labelled off, door, on) to the shifter. 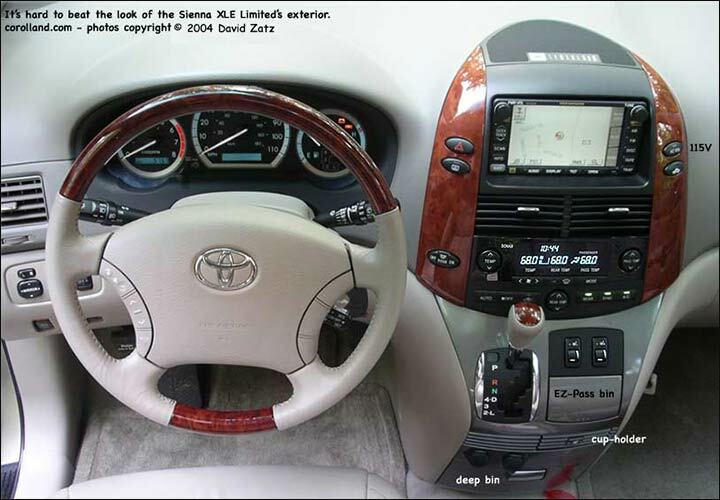 The XLE includes stereo controls on the steering wheel; lights are controlled from a stalk on the left, with interior lighting oddly set by the odometer/trip odometer button. Front and rear wipers get their own right-hand stalk. Hazards and the rear defroster are clearly labelled and set apart in a prominent location on the center stack, next to the nav system screen. Less-used buttons, such as the back and slide door power controls and the tire pressure system reset, are on the left part of the instrument panel, out of the way but not completely out of sight. Seat warming controls have convenient rheostats rather than the usual single- or two-level buttons. The stereo is fairly easy to operate, despite being part of a navigation system. The touch-screen certainly helps, as do the two knobs (power/volume and tuning) which take care of the most basic needs, and the dedicated buttons for AM, FM, disc (CD and DVD audio), tape, station scan, and station seek / CD track change. Pressing OPEN slides the screen out of the way to reveal the CD changer and cassette opening, a clever way to save space. Pressing AUDIO provides a screen with relevant information (station presents, CD information and controls, etc. ); from that screen, you can activate or shut off the surround-sound mode, or press SOUND to get to another screen with bass, midrange, treble, balance, and fade controls. The touch screen makes stereo manipulation pretty easy, but it really shines with the navigation system, where typing in addresses is far, far faster than with a knob or dial. We found the navigation system to be fairly flexible, with similar features to competing systems otherwise. We did find that it fell a bit short on secondary roads, showing many of them with letter-codes rather than standard names, and being unable to route trips along them; it could get us to the point where we entered a network of relatively small and rarely-used roads, but not into them or across them. This shortfall sometimes caused us to take moderately long detours until we figured it out. Generally, however, we found the system to be unusually easy to program and live with, partly thanks to its voice shutoff feature. On the whole, it's the best we've used - as long as you're sticking to relatively well-travelled areas. The climate control has three zones, like that of the Grand Caravan, with easy controls and a prediliction for wanting to have the recirculation on (fresh air is bad for your health?). The minimum fan setting is fairly strong, and the high setting is very noisy. However, it's easy to use, with roof-mounted rear controls that can be overridden from the front. The sonar (backup sensor) is included in the climate control display, with a picture of a generic car; an LED blinks (or remains steady if you're VERY close) to show which sensor is showing something ahead. On of the cool features of minivans is the dual power sliding doors that came after over a decade of development, to quickly appear on all models. These are controlled by buttons on the key fob, buttons on an overhead console up front, buttons mounted in the door pillars, and the actual interior and exterior handles. Unlike the Dodge/Chrysler design, which lets you ignore the motor when you want to do things yourself, Toyota engages the motor when you start to open or close any of the doors (the rear hatch will allow manual opening, but the motor takes over when you try to close it). You can easily open both side doors and the rear hatch with three fingers on the overhead console; the rear hatch requires a sustained press, whether you use the button or the key fob. (The doors must be unlocked before they will open.) All the doors have a blockage sensor and will stop when they hit something; for the side doors it's fairly sensitive, but we wouldn't give the rear hatch our "head test." The latest craze is folding seats that store in the floor. Toyota's rearmost seats are this type, and when used as regular seats, their well is open and available for a week's worth of groceries (without stacking! ), or a tall, thin piece of furniture. Folding is very easy - easier than with Chrysler or Honda minivans; and they fold perfectly flat. Yet, the seats are comfortable for people of average height (even though they don't look it). The middle row is fixed, except for the seatbacks; reclining too much in these is uncomfortable. All seats in our test car (except the back row, which is a bench seat with a 2/3 split for folding) had their own fold-down armrests, again in the time-tested Chrysler style. The only drawback of the Sienna as a cargo carrying machine is the relatively tall lip, but that won't be an inconvenience most of the time. 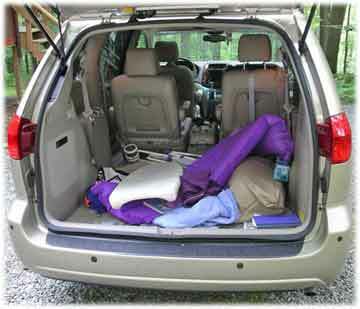 The Sienna is filled with conveniences that are standard on minivans, along with some that are not. Among the unusual items are a steering wheel both tilts and telescopes; a 115 volt AC plug in the rear for items that take standard household current (it's activated from a button on the center console); a two-level glove compartment, so you can have maps separated from the usual rubbish; and map pockets on all four doors. More standard are a large dropdown center bin that can be moved from place to place; dual power adapters up front; a handy trip computer that tells gas mileage, distance to empty, compass heading, and outside temperature; rear hatch wiper/washer and defroster; remote control for the optional roof-mounted video system; and nice, large mirrors that fold in if needed. We like some new touches, such as the mirroring of radio controls on the rear video, and the mirroring of the movie playing on the front screen (if the emergency brake is on and you press the DISC button twice). While the XLE Limited starts at $34,480 - quite a lot for a minivan but not much for an SUV of similar size - that includes a huge amount of equipment, including front and rear disc brakes and aluminum 17" wheels, distance-cruise control, front and rear parking assistance, anti-theft system, three rows of side airbags, antilock brakes, traction control, tire pressure warning, heated power auto-dimming driver's mirror, high-intensity discharge headlights (the trendy bright blue ones), fog lights, wiper de-icers, leather, auto climate control with three zones, three power-opening doors, heated front seats, wood package, power moonroof, and tilt/telescope wheel. Toyota was kind enough to add to that the $200 floor mats and $3,630 "Limited Package #6" - adding the navigation system and rear camera, JBL sound system, and DVD entertainment system with two wireless headphone sets. Not bad if you can afford it. 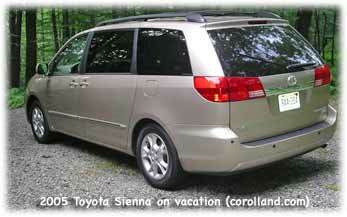 The total cost of our Sienna was $38,000, with a boatload of options and an interior that was more Lexus than Toyota. That might seem like a lot, until you compare the Sienna to, say, a loaded Chrysler Pacifica or Chevy Yukon, or a base Cadillac Escalade or Lincoln Navigator. Suddenly, the roomy interior and high gadget content seem like a bargain, especially when you throw in Toyota's legendary quality control. The premium for a Sienna is actually quite small when you equip it similarly to a Grand Caravan or Odyssey, even given the competitors' heavy rebates; perhaps that's why there's a long waiting list for Siennas. We love the Grand Caravan; but we can't resist the Sienna's value or promise of superior reliability.